British investigations reveal the shocking extent of his shady tactics. Can we really believe he hasn’t used the same methods here? Prime Minister David Cameron told the BBC in April that “the idea there was some grand bargain between me and Rupert Murdoch—that is just not true.” The devastating May 1 parliamentary report, which concluded that Murdoch “is not a fit person” to run a major public company, offers a vivid example of why political connections have always been so important to the media mogul’s business model. The very phrase “not a fit person” is a clear signal to Ofcom, the British broadcasting regulator, which has the power to take away Murdoch’s broadcasting franchise here. Yet the sharp divisions among the select committee—whose five Conservative members all voted against the report, which passed thanks to the one Liberal Democrat and five Labour members—have blunted the report’s force while at the same time underlining just how much was at stake when Murdoch gave Cameron’s party his backing. Let’s look at the record. Thanks to Judge Brian Leveson’s Inquiry into the Culture, Practice and Ethics of the Press, set up by the government after a public outcry over disclosures that Murdoch’s employees had hacked into the voicemail accounts of hundreds of British celebrities, politicians and public figures, we now know that Rupert Murdoch met with Cameron fifteen times while he was leader of the opposition—including four times in the two months just before the 2010 election. His son James Murdoch met Cameron twelve times during that period. Both Murdochs have long resented the role of Ofcom and the publicly funded BBC. In July 2009 Cameron announced that if the Tories won the next election, the regulator would be abolished. The following month James Murdoch made a speech in Edinburgh attacking the BBC, accusing his family’s main broadcast competitor of having a “chilling” effect on British television and seeking to “throttle the news market.” Within days Jeremy Hunt, the shadow culture secretary, had an article in Murdoch’s Sun newspaper demanding the BBC cut back on commercial activities and calling for the BBC’s license fee—its main source of income—to be frozen. That September James met Cameron for drinks at The George, a private club in Mayfair, to tell him the Sun would be switching its allegiance from Labour to the Tories. After the election came the quid pro quo—not just a punitive financial settlement for the BBC, or deep cuts to Ofcom’s budget, though that all happened. Far more important was Murdoch’s $12 billion bid to take full control of BSkyB, the satellite broadcaster he helped found but owned only 39 percent of. 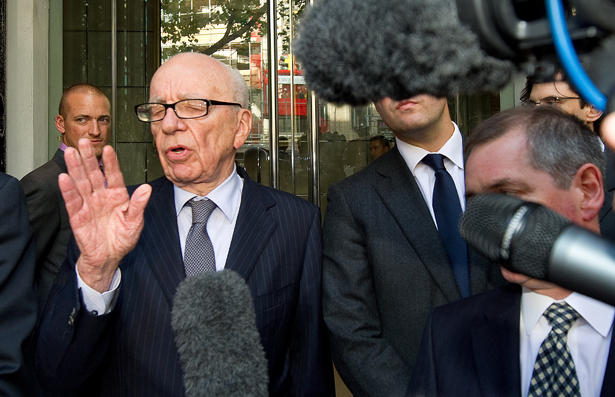 The deal would have been the biggest in News Corporation history, and we now know—thanks to the 163 pages of e-mails and documents released by Leveson—that the Murdochs were able to follow every move of the government’s supposedly “quasi-judicial” deliberations on the takeover through a back channel between Hunt and News Corporation lobbyist Frederic Michel. As we go to press, Hunt has so far held on to his job by shifting the blame to Adam Smith, his special adviser, who had more frequent contacts with Michel. But this pattern of a “clean” politician jettisoning his “dirty” adviser is dangerously reminiscent of Cameron’s relationship with Coulson. Hired after a suspiciously perfunctory security check, Coulson, who was arrested in July, served as Cameron’s press adviser until the phone-hacking scandal made having an in-house conduit to the Murdochs a liability rather than a convenience. In American terms, Smith was Hunt’s bag man—as Coulson presumably was Cameron’s, each affording his respective political boss a measure of deniability. But then one of the most striking aspects of this whole scandal is the way that it has—at least until recently—remained so resolutely a British affair. Are we really expected to believe that Murdoch’s minions, having hit upon phone hacking as a cheap, effective source of celebrity gossip and political leverage, would decide that such methods were unsuitable for Americans? Or that “blagging”—the obtaining of bank account details, medical records, unlisted phone numbers and other private information through various pretenses—is an art unknown to Murdoch’s American tabloids? So far sixteen of Murdoch’s executives and senior editors have been arrested by British police, along with ten reporters and one senior executive. And in the United States? Jude Law has publicly charged Murdoch’s men with hacking his cellphone on American soil; Mark Lewis, the English lawyer who represented the family of slain British schoolgirl Milly Dowler in their suit against Murdoch, recently met with Norman Siegel, former head of the New York Civil Liberties Union, to consider action in US courts. Last July the Wall Street Journal reported that the Justice Department was preparing subpoenas. Since then—nothing but rumors. In his new book Dial M for Murdoch, Tom Watson quotes former MP Adam Price’s explanation of why Parliament was initially so reluctant to investigate. Price, a gay man, said, “I was told by a senior Conservative member of the committee, who I knew was in direct contact with executives at News International that…they would go for us—effectively they would delve into our personal lives in order to punish [us].” Do those tactics, too, apply only east of the Irish Sea? Is the owner of Fox News untouchable during an election year? Or is there some other explanation for the Justice Department’s seeming lack of interest?